Fordham Lee Poffenbarger, born June 2, 2005, was the beautiful and perfect son of William and Amy Poffenbarger. 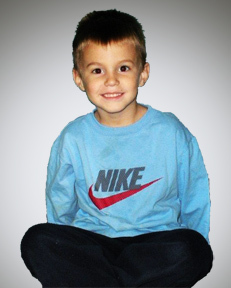 Fordham Lee was taken to heaven March 21, 2010, just shy of his 5th Birthday. Fordham’s infectious smile, beautiful brown eyes and sweet nature made him a gift to everyone he touched. His name Fordham is a family name; it is Amy’s maiden name and continues to be passed along through aunts, uncles and cousins. Fordham Lee looked up to his big brother Reese and big sister Saylor, and was the constant companion and awesome big brother to his younger brother Brittin, with whom he shared his room. May 19, 2012 Fordham Lee became a big brother in spirit to Higgins Lee Poffenbarger. His days were happily spent playing outside with his favorite John Deere tractors and trucks. There was a special dirt spot in the yard you could always find him playing in. He also enjoyed fishing at Grandma’s pond, riding his 4-wheeler, playing in the creek, playing catch and playing in the snow. Fordham loved to be with his family, snuggling on the couch watching his favorite movie CARS. He also enjoyed listening to music. The theme song from Cars, Life is a Highway and Don’t Worry Be Happy were two of his favorite songs. Eating cookie dough was his favorite. Fordham Lee was adored by his parents, sister and brothers, and continues to live in the hearts of his extended family and close friends who cherished his short time here on this earth.